Small Island Games’ upcoming puzzle odyssey Haiku Adventure is the curious work of a former architect and humanitarian relief officer. Inspired by the Japanese traditions of ukiyo-e woodblock prints and haiku poetry, it centres on an old hermit whose home is faced with imminent danger as a volcano is set to erupt. 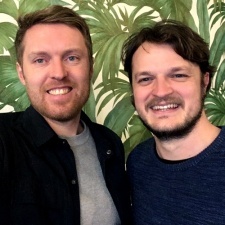 The game’s origins are rooted in the previous professions of Small Island Games’ founders Ceri Williams (pictured main, left) and James Morgan (pictured main, right). While they originally met at Cardiff University when studying architecture, only Williams would go on to become an architect, with Morgan moving into humanitarian work. The call of the games industry would be unexpected, but as Williams would work on more projects he realised it gave him something he had been missing artistically. “I realised more and more that it contained the stuff that I miss,” Williams tells PocketGamer.Biz. “When you become an architect it can become all about emails, budgets and legal things. 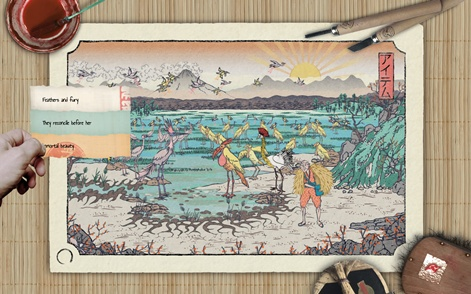 Williams goes says that throughout his time in architecture and earlier work with games, the idea of Japanese block prints was something that would consistently come back to him. On top of that, the questions they tended to pose about nature, disaster and man’s role in it would also be a draw. Along the way we want to question whether it’s always right to intervene in nature and whether the consequences of intervening may actually cause more issues. It is, perhaps, to no great surprise then that Williams and Morgan crossed paths again with a story about man and nature being put into motion. “It follows an incident in the life of this hermit who is living this natural environment in seclusion and there’s a volcano that’s going to erupt,” Williams explains. “To him, he feels that it’s going to be the end of everything and the fear of what might happen leads him on this journey to try and use haiku to stop this thing from happening. “Along the way we want to question whether it’s always right to intervene in nature and whether the consequences of intervening may actually cause more issues. The addition of Haiku followed on quite naturally with the discovery that they were supposed to be found rather than read, which added a kind of mysticism to the mix. Williams tells us, however, that great care had to be taken as a haiku can vary in length, with the five-seven-five syllable model being typically English, whereas in Japan it could be as short as one to two words per line. “We’re moving towards the short-long-short as the structure rather than counting the syllables,” says Williams. 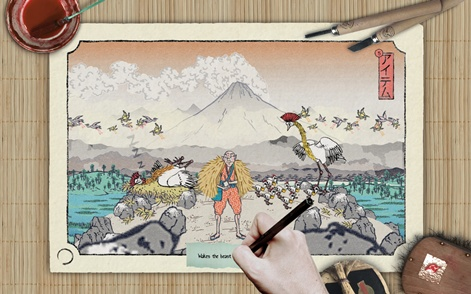 Haiku Adventure is set to release later this year, but not before an exhibition of the game's art happens at the William Morris Gallery, where Williams and Morgan sought inspiration. “In the early stages of formulating our vision for the game Ceri and I visited the William Morris Gallery where their collection of Japanese prints helped galvanise our belief that this visual style would be a great fit for the game we wanted to make,” says Morgan. This interview is part of our Indie Spotlight series highlighting the innovative of small mobile games developers.